At least 115 children have been killed and 172 injured in Yemen as the Saudi-led operation against Shiite Houthi militia forces enters its fifth week, UN agency said, adding that the total number of the dead and wounded kids may be even higher. “The number of child casualties shows clearly how devastating this conflict continues to be for the country’s children. Without a speedy end to the violence, children will be unable to lead normal lives,” Julien Harneis, UNICEF Representative to Yemensaid. 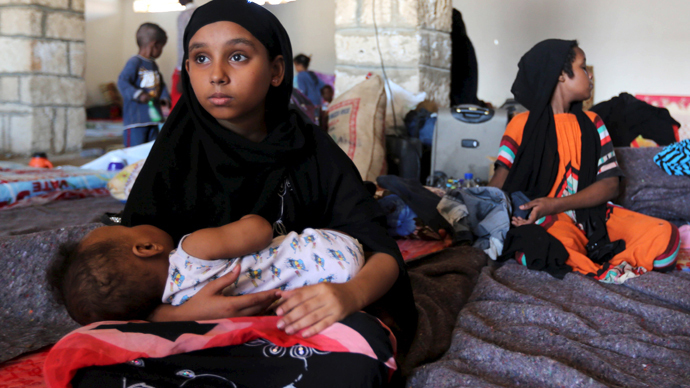 “There are hundreds of thousands of children in Yemen who continue to live in the most dangerous circumstances, many waking up scared in the middle of the night to the sounds of bombing and gunfire,” added Harneis. The agency estimates say that at least 140 children have been recruited by various armed groups. Some 23 hospitals have been attacked in the crisis-torn country and about 30 schools have been damaged or taken by parties in the conflict. On Friday, the UN said that a total of 551 civilians have been killed since Saudi Arabia launched 'Operation Decisive Storm' against the Houthis. On Wednesday, the World Health Organization (WHO) presented even higher numbers of casualties in Yemen, saying that a total of 1,080 people have been killed, and over 4,300 injured since the beginning of the strikes last month. The killings of civilians, including scores of children, in Yemen must be urgently investigated, human rights group Amnesty International declared on Friday. It said its investigations revealed several cases that question Saudi Arabia’s compliance with international humanitarian law in connection with the bombings. On March 25, Saudi Arabian forces, joined by nine other countries, launched a military operation in Yemen against Shiite Houthi rebels, who seized the Yemeni capital, Sanaa, and large territories in the west.